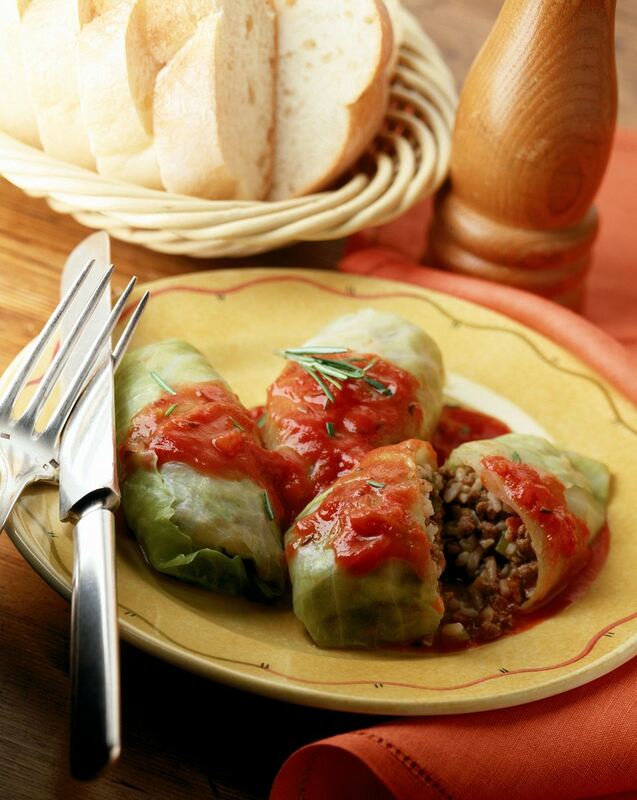 This recipe for Polish stuffed cabbage or gołąbki is from chef Marek (Mark) Widomski, founder and director of the Culinary Institute in Cracow, Poland. Chef Mark and his staff offer classes in everything from peasant food to gourmet cuisine. Instead of using rice as a filler, chef Marek uses buckwheat groats (kasza gryczana), and a tomato sauce finish. Place whole cored cabbage head in a large pot filled with boiling salted water. Cover and cook 3 minutes, or until softened enough to pull off individual leaves. You will need 18 leaves. Drain in a colander and cool. Cut out the thick part of the main vein of the 18 leaves. Coarsely chop any remaining cabbage. In a skillet, sauté large chopped onion in oil until golden. Transfer to a bowl and add pork, cooked and cooled buckwheat groats, salt, and pepper. Center a portion of meat mixture on each cabbage leave. Fold the bottom edge of the cabbage up and away from you. Fold in the sides and roll as for an eggroll. Place some of the coarsely chopped cabbage in the bottom of a large casserole or Dutch oven and add the gołąbki, in layers, if necessary. Top with remaining coarsely chopped cabbage. Add 1 cup boiling salted water and cook on the stovetop for 45 minutes or in a 350 F oven for 45 minutes. Sauté small chopped onion in butter until translucent. Stir in flour thoroughly and whisk in cold broth. Add tomato paste and cook on a low flame until thickened. Season to taste with salt, pepper, and sugar. Serve over cabbage rolls.